This episode has one of just a few timing references in the series: It's been 3 years since Zuko was banished. We are introduced to Azula in her full lightening-bending glory. She'll be taking the place of Zhao as the villain who makes Zuko look like I sweet widdle w00b by comparison. We also see Li and Lo for the first time, watching her practice on the deck of her ship. For some reason, I'm very fond of Li and Lo. But then, I am a shameless FNS. "Father regrets your banishment. He wants you home." Azula, you BRAT. (<--too nice a word, but I keep my journal G-rated.) This scene breaks my heart for Zuko. Grown-ups are such fools in this show. Well, mostly. Iroh is a notable exception. I just can't believe how idiotic General Fong is in this episode. The last scene is well-done. You can feel the significance of the action Zuko and Iroh take in cutting off their topknots, even without knowing any specifics of what it means in their culture. Chong! This guy cracks me up. Chong's songs are so awful! They're the best thing ever! This may be my favorite of the humorous episodes in the series. Which is saying something, because I usually go for the emo stuff, not the funny stuff. Aw, Song. When I first watched the series, I was looking hard for a love interest for Zuko, so I definitely caught a Song/Zuko vibe in this episode. Anyway, romance or no, it's an interesting encounter for Zuko. It's the beginning of his awareness of life beyond the Fire Nation. Even in exile, it's like he'd always carried a bubble of Fire Nation around him, so he didn't really see the rest of the world until now. He starts to gain understanding of what it really means to lose one's honor. Song's pronouncement that "the Fire Nation has hurt you" seems almost prophetic. Uh-huh. Katara's got that little blush at the end. She's thinking about what happened when the lights went out! "I need a small, elite team." <333 The villainess trio rocks my world. I adore them. Ty Lee was my favorite at first. (Yes, I had her pegged as a possible love interest for Zuko. Oops! I had my Zuko-love-interest rader turned up waaay too high.) But I grew to love Mai the most, despite the unfortunate spelling of her name. Mai's mother is so overly-dramatic and tragical. Hmmmm….think that might have had a reactionary effect on Mai? Love the shot where "Ozai's Angels" walk up onto the platform to meet the Gaang. They're just. So. Cool. This episode made me think of Star Wars: finding enlightenment in a swamp. Zuko here is not only outside his Fire Nation bubble, but also outside his royalty bubble. I'd forgotten how hard for him to adjust it was at first. "Down with the Avatar!" Oh, situational irony, how I love you. "You must never give in to despair. Allow yourself to slip down that road and you give in to your lowest instincts. In the darkest times, hope is something you give yourself. That is the meaning of inner strength." This scene between Iroh and Zuko reminds me so much of a similar one in Fruits Basket vol. 11 between Kyo and Kazuma. Like Kyo, Zuko is not yet ready to take his father-figure's wise advice to heart. LOL, in the last scene, when Kyoshi takes over Aang's body to give her defense, I have this mental image of her about 10 seconds before that in the spirit world, just giving this exasperated sigh—as if she's thinking, "Do I really have to come back from the spirit world to talk to these idiots?" There's another uncut animatic on this disc, for chapter 1, but I don't have anything to say about it. For some reason, I'm very fond of Li and Lo. But then, I am a shameless FNS. Yeah, I've realized that my favorite characters are Azula, Zuko and Iroh. So I'm feelin' ya. They're not that bad as a group. General Fong, yes. But besides Iroh I would say there are a lot of adult characters who aren't idiots.... Zhao, Ozai, Hakoda, Jeong Jeong, Pakku, Ursa... and even Bumi is so crazy he's smart. And maybe a few more people we haven't met yet (this is the spoiler-free post). Overall I felt like the situation did always end up so that adults got pushed to the side in favor of the kids, which is pretty standard in kids TV, but there were plenty of non-idiot adults. YYY best quirky mini-boss squad ever! 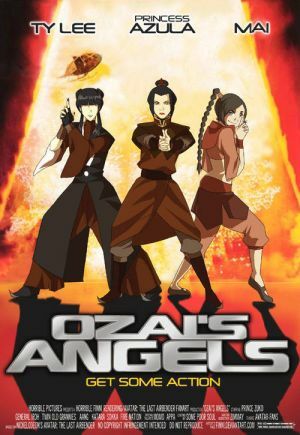 Seriously, season one was great, but when Azula and her sidekicks appear on the scene this show really becomes the show I love. Recurring adults are not always idiots but they do have a tendency to get taken out of the action. Single-episode adults like General Fong or the mayor of the town in "Avatar Day" are usually idiots, though. And there are some recurring characters, like those goons who try to chase down Toph, who are pretty dumb. 1) Iroh is freaking rad. --and I'm going get a tea set for at work and start making jasmine tea every day to show my support. "Secret Tunnel! Secret, secret, secret, secret tunnel!"